We actually had a really good, big harvest from our green bean plants. The problem, however, is we only had one. And it came at the end of August. Most of this is our fault. First, because we planted them too late — in June after the peas were done. Second, because we forgot to check them after the first bowl. We also attribute some of this to the weird weather this summer. It was cooler than most summers and we had a lot of rain in July. The Kentucky Wonder pole beans grew very well — some tendrils and leaves reached more than six feet tall and wrapped around our garage toward the tomatoes. But once they started to actually mature into beans, quite a few were bulging, which means they’re overly mature and could be tough (not good). 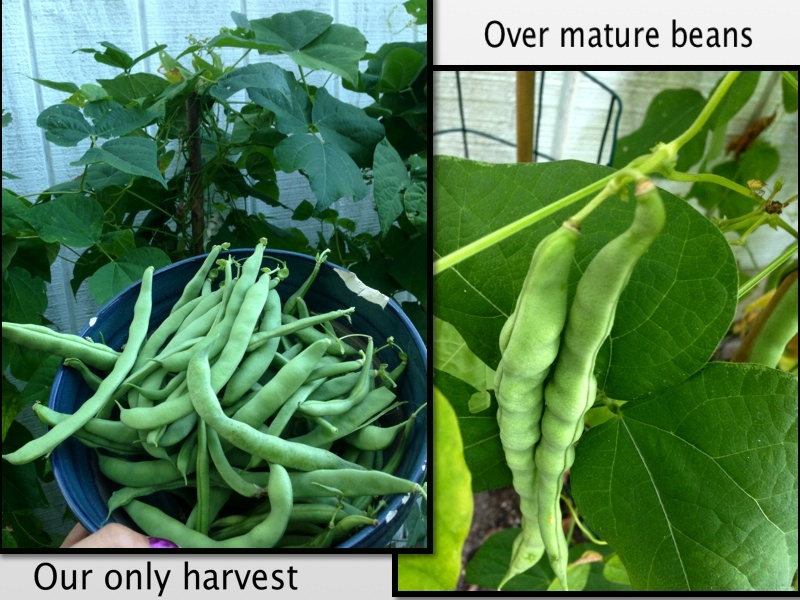 The good and the bad of our green bean harvest. We made a delicious garlicky green bean sauté (recipe below) but wished we had more throughout the summer. On a positive note, the deer didn’t eat them like they have the past couple years. So, what can be done better next year? We need to plant early! And check on them more often. I’d love to have a steady supply throughout the season. We had about a pound or so of the green beans, and this is an adaptation of a recipe I found. First, snap off the ends and de-string the beans. Then cut/trim to desired size. Toss into a pot of boiling, salted water and cook for about three or four minutes. While those are cooking, add garlic to hot pan with oil. We used about four or five cloves of garlic. Once the green beans are done, transfer from the boiling water to the pan with garlic and continue to sauté for another four or five minutes, stirring, until the green beans are crisp tender. After what seemed like an endless streak of hot weather and FOREVER without rain, the past couple weeks brought a break in the 100-degree heat and a handful of much-needed moisture from Mother Nature. Our green beans are finally growing again and starting to climb the poles. The tomatoes are turning red, and the squash plants are blossoming. While most of that is good news, nothing is ever perfect. We have deer repellent (cloth bags filled with meat meal and red pepper–kind of gross, but it seems to work) hanging in our woods and near the green beans to deter them from feasting on our efforts. It appeared to be effective. At least I thought so. Last week I went outside to check on everything and noticed most of our lettuce was gone, except for a couple small clumps. Matt said he didn’t pick any so my best guess is the deer thought it would make a nice snack. On a positive note, however, that gives us a little room to try broccoli again for a fall harvest, and some of the lettuce is the “cut-and-come-again” leaf variety so a couple gnawed plants are putting out new leaves. It appears that everything is starting to turn around, which is a good thing!